I’ve known of Dr Helen Kara and admired her work for some time now. She is one of that rare breed of independent academic who manages to make not being formally affiliated with a university work for her. I was pleased to be able to meet her in person and spend time together in late 2014. During this long cup of tea meeting I managed to convince Helen to write me a post about her amazing book writing productivity. Dr. Helen Kara is director of We Research It Ltd in the UK. Helen has been an independent researcher since 1999 and was awarded her PhD in 2006. She specialises in writing about, and teaching, research methods.You can learn more about Helen on her blog or follow her on Twitter. In my final year of doctoral study, I realised I wanted to write a book about research methods. There are already so many books on the topic that I knew I would need to think of a good angle, which wasn’t easy; plus I was busy earning my living as an independent researcher. Then in mid-2010 the UK hit a recession and I found myself with a lot less paid work and much more time. In early 2011 the idea hit: I realised I could write a book that explained how to do research along with everything else, rather than treating it as though it exists in a bubble. I’d co-written a book before, and had worked in publishing too, so I knew that publishers need authors more than authors need publishers. Rookie writers often don’t understand this and think publishers are doing them a favour by taking on their work. It’s not so: publishers wouldn’t exist without authors, while in these days of self-publishing some authors can operate very effectively without publishers. I looked at UK publishers of research methods books and chose Policy Press, a non-profit publisher with a strong social justice ethos. I rang the commissioning editor to talk through my idea, primarily to make sure they didn’t already have something similar in the pipeline. They didn’t, and she liked the idea. As Policy Press is an academic publisher, they put both the book proposal and the draft typescript through anonymous peer review. That was fine with me; I welcome feedback because it helps me write better books than I can do alone. Writing the proposal was an interesting exercise, making me do rather more thorough planning than I might have done otherwise. Once the proposal was accepted, writing the book itself was both straightforward and quite hard work. It involved writing down everything I knew about research methods, working out where the gaps were, and filling those gaps. To do that I used desk research and interviews with researchers at various levels. I also had to devise ‘pedagogical features’ which ended up as tips, tables, bullet lists, and quotes from interviews. Neither my publisher nor I could come up with a snappy title, so we settled on Research and Evaluation for Busy Practitioners: A Time-Saving Guide. I was lucky enough to be offered a launch at the British Library in October 2012, which was a wonderful occasion with a panel of speakers, a string quartet, an exhibition by the book’s illustrator, wine and nibbles. I had a wonderful time. Afterwards I felt relieved: I had written the book I’d always wanted to write, so I’d never need to do that again. My publisher loved the idea. This book was harder than the first (that difficult second research methods book!). I read part or all of around 800 reports of research and other related documents, mostly from academic journals and books. There was loads more stuff out there than I expected when I started the search, which was a problem in some ways and a blessing in others. This time the pedagogical features involved boxed examples of creative methods in practice – over 100 of them – plus a range of online resources on the book’s companion website. 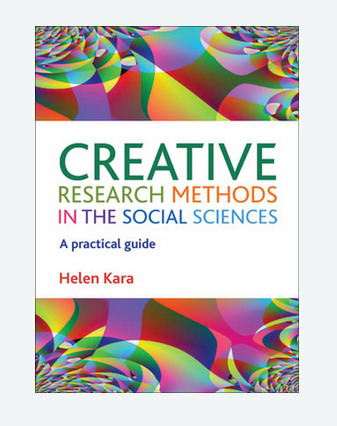 I arranged to launch Creative Research Methods for the Social Sciences: A Practical Guide at a one-day conference on creative research methods, again at the British Library, in May 2015. I had to do a lot of work to help organise the conference but it was well worth the effort. Around 200 people came, from three continents, and it was a hugely successful event. Afterwards I felt relieved. I never needed to write another book. So my next traditionally published book will be on research ethics and should be out some time in 2018. This one is an even bigger stretch, and – as with the other two – I have moments of bellowing WHOSE STUPID IDEA WAS IT TO WRITE THIS DAMN BOOK? In 2015 I expanded into self-publishing with a series of short e-books for doctoral students. Each is around 10,000 words long and focuses on an aspect of doctoral study: starting your PhD, gathering data, analysing data, writing, research ethics, and finishing your PhD. For the first and last I used beta readers from the target groups, and for all six I employed a professional editor, because part of being a good writer is knowing I need an independent view from someone who can help me make my work better. I also employed a cover designer because I’m not skilled in visual design. Other than that, I wrote, published, and now market my e-books entirely myself. The first one, Starting Your PhD: What You Need To Know, is free to download, while the others each cost around the price of a coffee. Also during that year, my colleague Dr Nathan Ryder and I had the idea of writing a similar e-book on Self-Publishing for Academics. This was a dream collaboration and the book, published in May 2016, ended up much better than either of us could have written alone. Later in 2016 I worked on the second edition of Research and Evaluation for Busy Practitioners, due out in April 2017. Doing a full revision, including a whole new chapter, made me cringe in places and feel proud in others. We reviewed the title, and ended up with Research and Evaluation for Busy Students and Practitioners: A Time-Saving Guide – even longer than the first version! I would have liked something shorter and snappier, but bowed to the superior wisdom of my publishers. I have made very little money from my academic publishing, but my books have supported my career. In particular, I have received a number of teaching and speaking commissions, in the UK and overseas, as a direct result of my writing. I now teach courses and workshops to doctoral students and post-docs about how to write creatively for academia and how to publish their work. And in another dream collaboration, I’m working with Dr Janet Salmons from the US to co-lead an online six-week course called Create Your Publishing Strategy, primarily for recent post-docs, to help people figure out what and how to publish in a way that will support their career goals. The next facilitated course begins on 13 Feb so this is an ideal time to register, or you can simply purchase the course materials at any time if you prefer self-directed study. I love writing and I understand publishing. I’m aware not everyone does, and I want to reduce the pain for those who find it painful, and enthuse those who can find joy in the process. This is my aim, in my books and in my teaching. If you have any questions about writing or publication, please leave a comment, or you can find me on my own blog or Twitter. And finally, thank you for reading – us writers are nothing without you! Thanks Helen – your productivity never ceases to amaze me! How about you? Do you have a research methods book or guide inside you? Ever thought about self publishing? Interested in your thoughts in the comments. What an interesting and inspiring post! Thank you. I totally agree (as co-author of a published book) that the proposal process is an extremely helpful part of the thinking and pre-writing process. When you work in collaboration with others, it becomes even more more important to the overall ‘feel’ and direction of the book. I loved this post as it was so informative on how to become an independent researcher and get your research published and read by a wider audience. Siempre me an enseñado sus artículos… siempre deja una puerta abierta para nuevas ideas y métodos. Siga con el buen trabajo y dando cómo da, a personas como yo, una lluvia de ideas y de propuestas para poner en práctica. Quiero escuchar pronto de usted… fantásticos artículos! Great post. You’re a power house Helen! What does your routine look like when you’re in the midst of book writing? Thank you for the review! Great resource!